It's the May 5th Coppa Italia first leg semi-final at the Juventus stadium in Turin. The 11th minute of the match saw Mohamed Salah dribble past three Juve defenders over a distance of 60 yards and hammer one into the top left corner of the goal from inside the box. The second followed in the next half through a well-angled shot, sealing a memorable win for his side Fiorentina. It was Juventus's first home loss after 48 games. Yet, here was this 22-year old Egyptian who didn't fit into Jose Mourinho's gameplan at Chelsea just last season. He featured in just 10 games for the Blues in the 2013-14 season and scored just twice. In the 2014-15 season from a period spanning from August to January, he averaged just nine minutes of playing time per match. Mourinho seemed glad to exchange him for Juan Cuduardo for £23.3million. 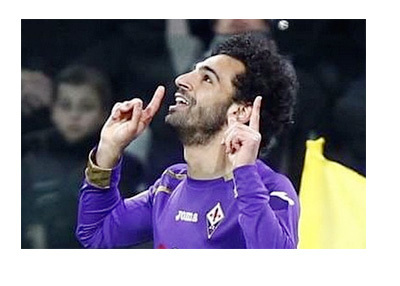 While Cuduardo has yet to score for the Blues in his five appearances, look what Salah has delivered for his new Italian owners, Fiorentina, in just 2 months. He has found the back of the net six times from his seven matches. Three of those were in Serie A matches, two in the Coppa Italia clash with Juventus and one in a Europa Cup clash against Tottenham. Fiorentina manager Vincenzo Montella warned Salah on his arrival that he will have to adapt his game to Italian conditions and style, which he added were different from English and Swiss football - and how did he adapt!! It may be mentioned at this juncture that Salah had spent a couple of seasons from 2012 to 2013 for Swiss club, Basel where he featured in 78 games and scored 20 times. Fiorentina hope to make the best of the Egyptian winger's phenomenal speed, ball control and a knack for finding scoring opportunities. Although they are 5th in the Serie A standings currently with 42 points, they are just a couple of points behind 3rd-placed Napoli and a point below Lazio. With Salah in this kind of form they will certainly have their hopes high in finding a place in the top four by the time the Serie A season ends in May and qualify for the next year's UEFA Champions League. Add to that they seem to be within striking distance of a Coppa Italiana title and progressing well in the Europa Cup. This is a resurgent Fiorentina who have Chelsea to thank. Mohamed Salah has indeed made a point to the folks at Stamford Brige. Latest tweets from ex-mates Eden Hazard and Didier Drogba read "Momo on fire".